I have eagerly awaited this movie 4 years since I heard about it in one of the sites of three-dimensional graphics artists and I was looking forward to it because it is not just animated film but also science fiction, and from the director James Cameron who made Titanic, Terminator and Aliens. Before the film starting, some Trailers for other films have been announced, includingChristmas Carol, which has been announced in three-dimensional technology and I realized the good exploitation of the technology and it was the first thing that I has taken on avatar film, that it does not take the same advantage of this technology as used by Carol, it could do that very well in the scenes of war between humans and Na’vi. The story was about the neolithic Na’vi aliens living on Pandoraplanet which the humans discovered and dared to hope in its valuable mineral calledunobtanium which the RDA corporation particularly mining Pandora for it. 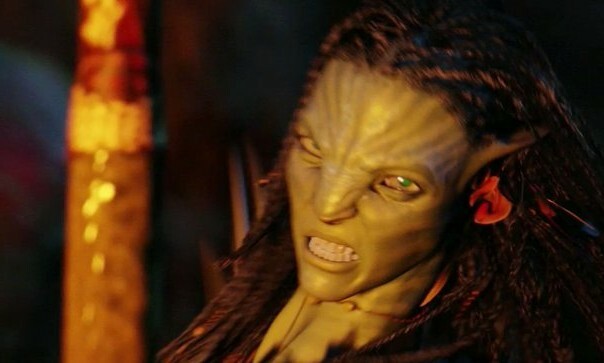 Human scientists have created human-Na’vi hybrids called avatars, which are controlled by genetically matched human operators to move in Pandora and finishes their goal. Jake Sully a disabled Marine who becomes part of the Avatar Program becomes separated and lost when his group is attacked by a large predator, attempting to survive the night in Pandora’s dangerous jungles; he is rescued by Neytiri, a female Na’vi who married him. Shortly the main goal of the film is to convince you that the humans are the monsters of the universe they killed other Creatures, themselves and destroy life on peaceful planet because of their Greed they called the creatures of the Forest “monsters” but they are that monsters they facing them just because they haven’t a language ! !, Not all of the humans are devils or monsters but as in avatar and reality the greedy part of them make wars. I also loved that the fictional creatures are not connected telepathically but with Nerve plexus that come out of the heads, the fireflies and algae that made me feel like it would touch me, the amazing control over the environment, soundtracks and the Na’vi Language which developed by Dr. Paul Frommera, The language has a vocabulary of about 1000 words, with some 30 having been invented by Cameron .. The most scenes that I loved were riding the winged red dinosaur in the sky, when Neytiri rescued Sully and in the lab when Sully got in his AVATAR. Yes i loved the technology of the film and the way of it’s execution but i am not amazed by the story. although the 3d technology may makes it one of the best 3d tech films, if it were not the only till now !